That time of the year is here again! Shopping for presents, decorating the house, bundling up for the cold weather, and spending time with family and friends; it can get a bit hectic here and there, but in the end, there’s nothing like the memories that are made during the holiday season. This year, let your holiday party–and the mouthwatering food you serve–be the talk of the town and at the forefront of everyone’s memory. At each holiday party, there always seem to be a common theme amongst the selection of food. 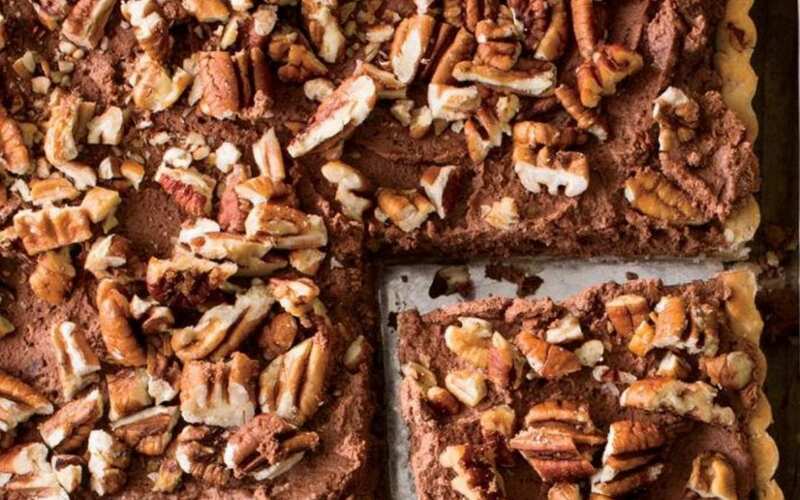 This year, why not let your star ingredient be pecans! Pecans are nutrition in a nutshell that work as the perfect complement for a vast variety of dinners and desserts. Aside from the traditional pecan pie or pecan crusted scallops, try concocting a variety of new pecan-center dishes that will wow your friends and families. Luckily we’ve helped you out a bit and took the time to compile a bunch of new, unique, and delectable dinners and desserts to feature at your next holiday gathering. Below we listed a few pecan-centered meals that feature something for everyone! With either of these meals served at your dinner table, your guests will be chomping at the bit for the recipes! Pecan Crusted Salmon: This dish is so simple that you can whip it up and serve it to guests all within 15 minutes! To spice up the dish, consider making a crispy apple slaw as a side. Click here for the recipe. Herbed Chicken with Barley and Pecans: This is another easy dish to prepare that’s both packed with flavor and healthy to eat! The combination of seasoned chicken, lemon-zested barley, crunchy pecans, and the piquant flavors of arugula mesh together to form the ultimate holiday dinner. For this flavorful recipe, click here. Rib Eye with Pecan Red Pepper Sauce: Meat-lovers beware: this smokey dish is bound to get your taste buds bouncing and your mouth watering. This is a dish that is certain to leave guests wanting second portions. The flavors of the rib eye combined with fire-roasted tomatoes, peppers, and crispy pecans all come together to create a phenomenal holiday dish with a touch of Spanish flare. To amp up this meal, consider having roasted vegetables, cauliflower mashed, roasted potatoes, or mashed potatoes as a side dish. Details on the recipe here. Butter Pecan Layer Cake with Browned Butter Frosting: This decadent, three-layer cake is bound to take the art of desserts to a whole new level. With its buttery goodness, hints of vanilla, and sweet crunchiness of pecans, this cake is sure to be a crowd pleaser. For an added boost of flavor, consider adding a pinch of cinnamon and nutmeg into the batter! Click here for the delicious details of this recipe. Chocolate Pecan Mousse Tart: Who wants to eat the old, standard apple, cherry, or pumpkin pie when you can make your guests a one-of-a-kind Chocolate Pecan Mousse Tart? The best part about this dessert is that you can make the crust whenever, freeze it, then thaw it out the night before you are going to serve the dessert! Click here for this rich and decadent dessert! Toasted Coconut Pecan Cupcakes: This special rendition of cupcakes is a perfect (and easy) dessert to serve at a sizable holiday party. These cupcakes are filled with flavorful hints of vanilla, coconut, and most importantly pecans! As if these tasty cakes weren’t enough, each is topped with a creamy dollop of coconut cream cheese frosting and sprinkled with crushed pecans. Hint: for a boast of flavor, consider drizzling a touch of chocolate or caramel sauce over the tops of the completed cupcakes. For this mouthwatering recipe, click here! Trust us, with one (or all) of these delicious pecan dishes at your table, your holiday celebration will be one your family and friends won’t forget! Georgia Pecan Nursery is a licensed live plant pecan tree nursery with over 43 years of experience in growing, designing, installing, & maintaining pecan orchards. Our trees range from 2 foot to 10 foot and are available as bareroot and container grown. We are a reputable pecan nursery with the best pecan tree sales! Learn more about our trees.